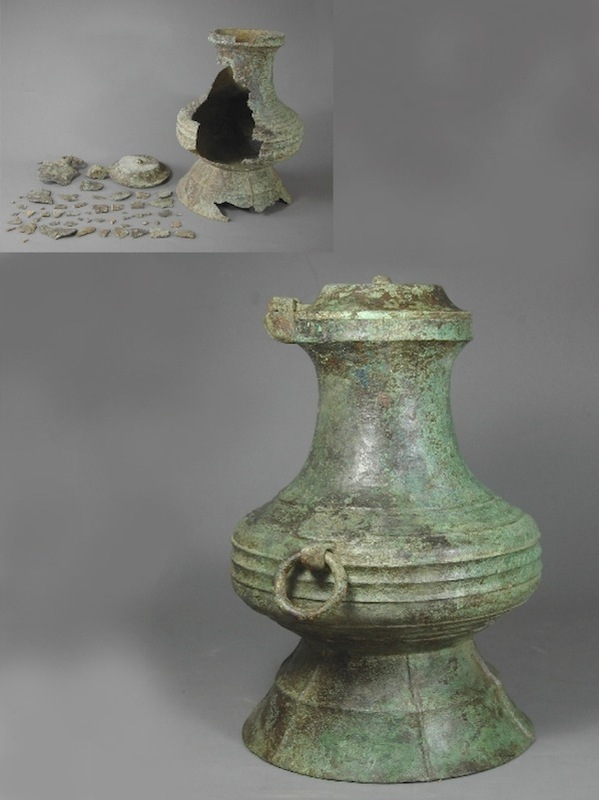 Chinese bronze Hu; the copper alloy was completely mineralized. Due to an accident the Hu fractured into numerous pieces. A synthetic resin was used to join the pieces and fill the missing areas. Acrylic paint was applied to cover the retouched areas. This process is almost completely reversible. 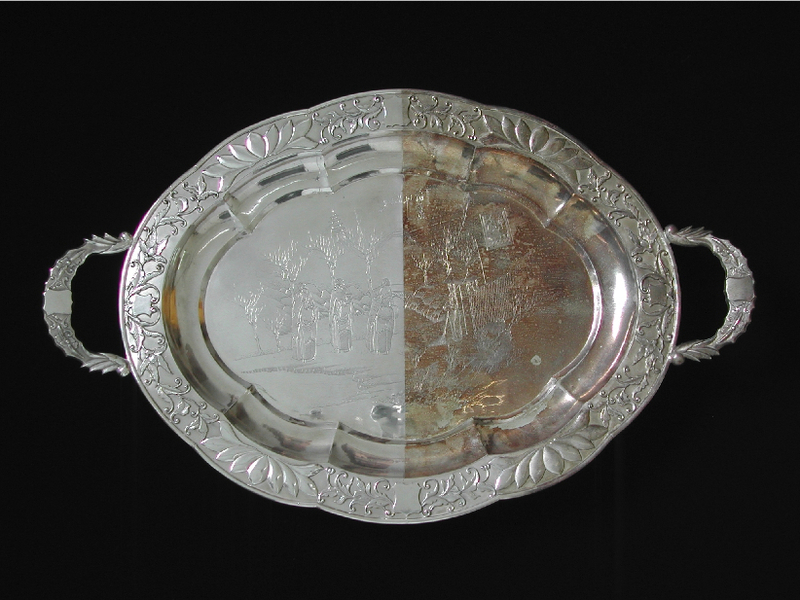 This export silver tray tarnished within weeks of being exposed in a tropical urban and coastal climate. It was cleaned and covered with an acrylic lacquer to prevent further tarnishing. This cloisonné tripod container probably late 19th early 20th century, was heavily damaged. The cloisonné was missing in several areas. In the lower right photos above an old restoration is depicted. The missing area was restored using plaster and oil paint. The plaster did not adhere well to the substrate, cracked and fell off. The oil paint discoloured over the years. The old restorations were all removed. 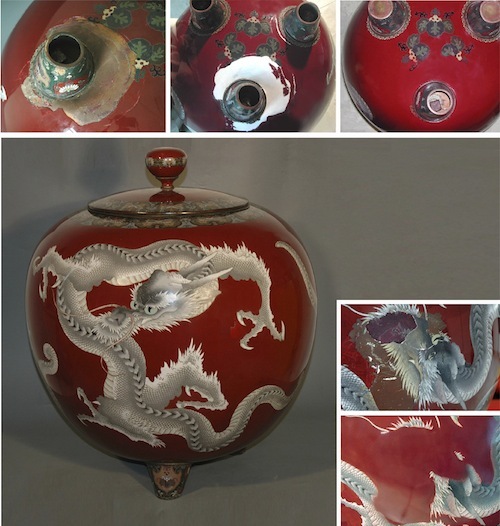 The missing cloisonné was replaced with acrylic filler and the missing areas colour matched with an air- brush. The missing decorations were not painted. 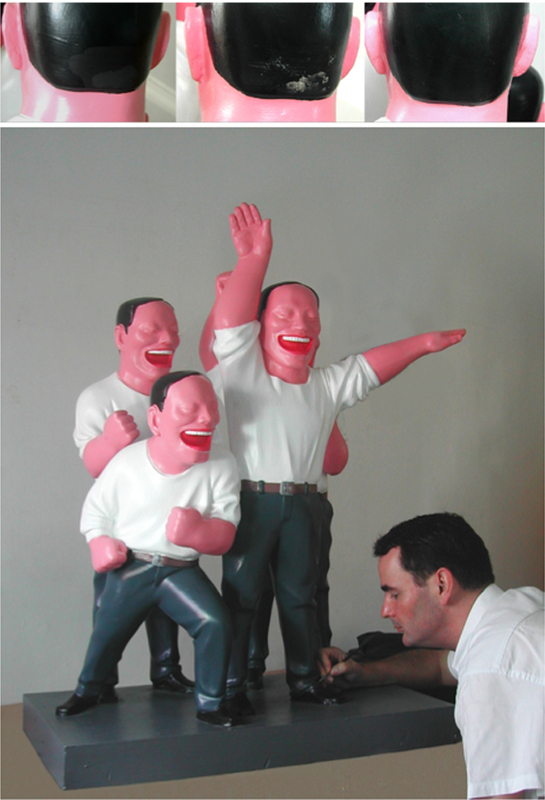 This Yu Minjun sculpture is glass fiber reinforced resin and painted. There were various old restorations and abrasions due to handling and poor hardening of the joints. The old oil restoration had to be removed and acrylic was used to retouch the damage.